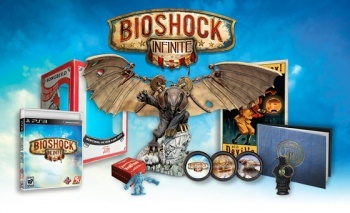 BioShock Infinite's two special editions come loaded with extra content. You know what would look great on a shelf next to your Big Daddy statue, Big Sister action figure, and vinyl BioShock 2 soundtrack? How about a 9.75-inch Songbird statue to commemorate the release of BioShock Infinite? If you've got a thing for collectibles, you might want to take a look at the BioShock Infinite Ultimate Songbird Edition, which comes with a hand-painted, resin-cast Songbird statue designed by Irrational Games concept artist Robb Waters. It won't come cheap, though: the Ultimate Songbird Edition retails for $149.99. -A 3-inch baby version keychain of the sold-out Murder of Crows vigor bottle replica. -A 5 x 7-inch lithograph by Jorge Lacera. -A 25 millimeter, resin-cast Handyman miniature from the upcoming BioShock Infinite board game by Plaid Hat Games, makers of Summoner Wars. -A mini art book, full of BioShock Infinite concept art and commentary, with a hand-distressed cover. -Various digital goodies: exclusive in-game gear, a digital soundtrack, and platform specific downloadable content (Avatars for Xbox LIVE, and Themes for PC and PlayStation 3). All of this premium content will also be included in the Ultimate Songbird Edition. BioShock Infinite will be out in February, but with the Premium and Ultimate Songbird Editions available in limited quantities, pre-ordering is recommended if you want to snag either of these collections next year. You can reserve them now in North America, and European and Australian gamers can pre-order starting on Monday, October 22.